Notes: From 1941 to 1943, the name and address of the next-of-kin was on lines 3-5 with religion abbreviation at end. Air Force became it's own branch in 1947. Religion was abbreviated until 1964 (P=Protestant, C=Catholic, H=Hebrew). Blood type had no positive/negative designation until the 1950s and varied in being recorded or known. Notes: Service numbers were typically 8 digits. USMC had the blood type on line 4 during WWII (USMC-O). Blood type had no positive/negative designation until the 1950s and varied in being recorded or known. MilitaryVetsPX.com Military Dog Tags are the same genuine, tooth notched, stainless steel dog tags used by the United States Military during World War II, the Korean War, and the Vietnam War. 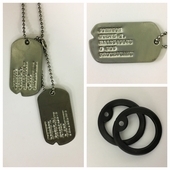 Tags will come the same way they were issued to you in the military; you get two embossed metal tags, one long chain and one short chain. Dog Tags also make excellent Medical Tags, Medical Alert Tags, Diabetic ID Tags, Luggage ID Tags, Pet Tags, Cat ID Tags and Dog ID Tags. Many pet owners prefer the use dog tags as a pet tag because of the amount of information contained on each tag.